Fibonacci is a huge subject and there are many different Fibonacci studies with weird-sounding names but we’re going to stick to two: retracement and extension. 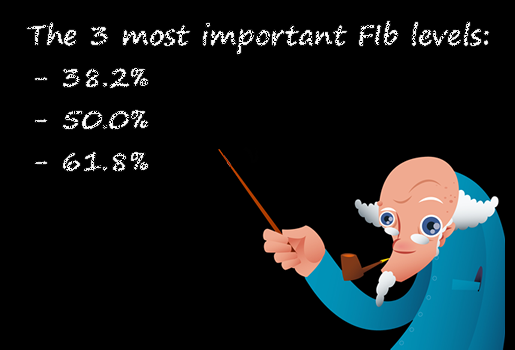 Let us first start by introducing you to the Fib man himself…Leonardo Fibonacci. This series of numbers is derived by starting with 0 followed by 1 and then adding 0 + 1 to get 1, the third number. Then, adding the second and third number (1 + 1) to get 2, the fourth number, and so on. After the first few numbers in the sequence, if you measure the ratio of any number to the succeeding higher number, you get .618. For example, 34 divided by 55 equals .618. In order to find these Fibonacci retracement levels, you have to find the recent significant Swing Highs and Swings Lows. 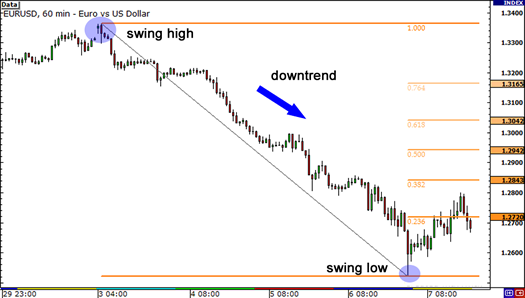 Then, for downtrends, click on the Swing High and drag the cursor to the most recent Swing Low. For uptrends, do the opposite. 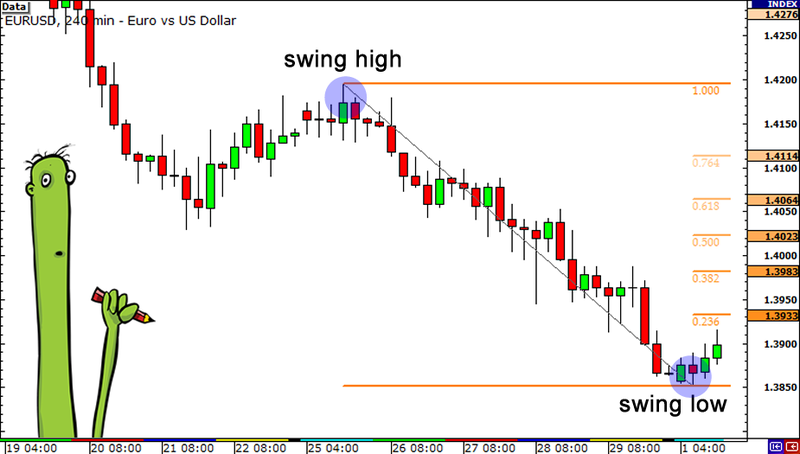 Click on the Swing Low and drag the cursor to the most recent Swing High. Got that? 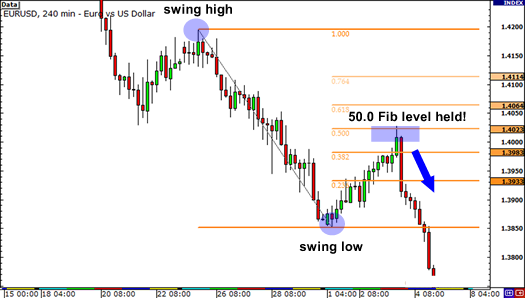 Now, let’s take a look at some examples on how to apply Fibonacci retracements levels to the currency markets. Here we plotted the Fibonacci retracement levels by clicking on the Swing Low at .6955 on April 20 and dragging the cursor to the Swing High at .8264 on June 3. Tada! The software magically shows you the retracement levels. 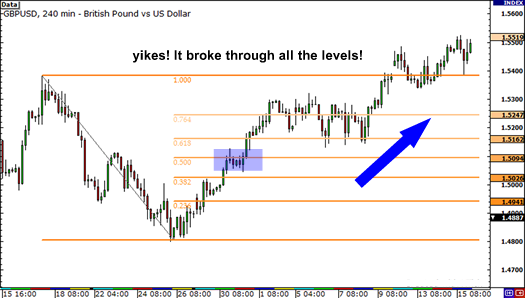 Price pulled back right through the 23.6% level and continued to shoot down over the next couple of weeks. It even tested the 38.2% level but was unable to close below it. Later on, around July 14, the market resumed its upward move and eventually broke through the swing high. Clearly, buying at the 38.2% Fibonacci level would have been a profitable long-term trade! As you can see, we found our Swing High at 1.4195 on January 25 and our Swing Low at 1.3854 a few days later on February 1. The retracement levels are 1.3933 (23.6%), 1.3983 (38.2%), 1.4023 (50.0%), 1.4064 (61.8%) and 1.4114 (76.4%). The market did try to rally, stalled below the 38.2% level for a bit before testing the 50.0% level. If you had some orders either at the 38.2% or 50.0% levels, you would’ve made some mad pips on that trade. 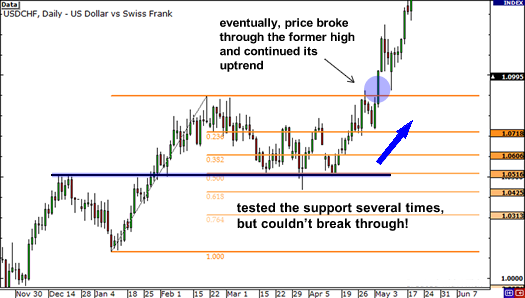 In these two examples, we see that price found some temporary forex support or resistance at Fibonacci retracement levels. 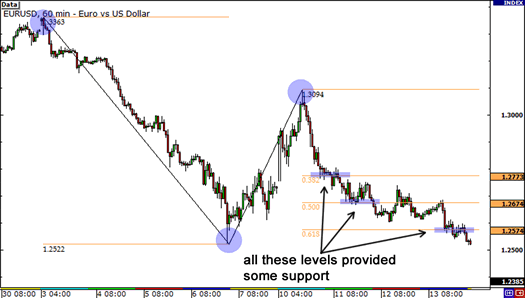 Because of all the people who use the Fibonacci tool, those levels become self-fulfilling support and resistance levels. For now, there’s something you should always remember about using the Fibonacci tool and it’s that they are not always simple to use! If they were that simple, traders would always place their orders at Fibonacci retracement levels and the markets would trend forever. Back in Grade 1, we said that support and resistance levels eventually break. Well, seeing as how Fibonacci levels are used to find support and resistance levels, this also applies to Fibonacci! 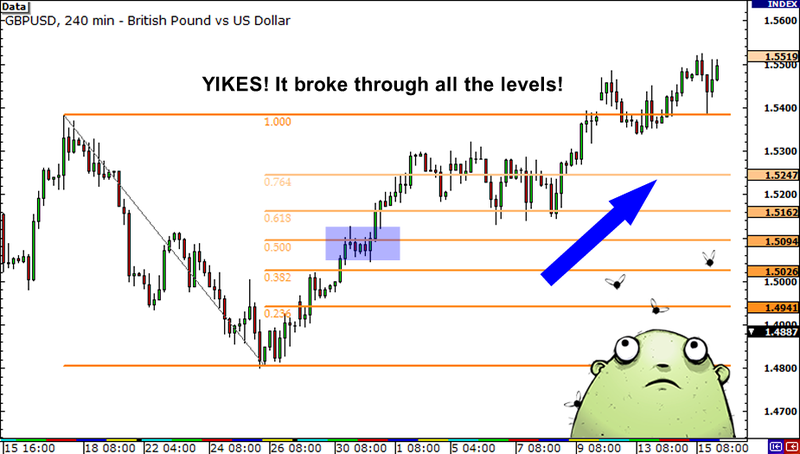 Fibonacci retracements do NOT always work! They are not foolproof. Let’s go through an example when the Fibonacci retracement tool fails. Below is a 4-hour chart of GBP/USD. Here, you see that the pair has been in downtrend, so you decided to take out your Fibonacci retracement tool to help you spot a good entry point. You use the Swing High at 1.5383, with a swing low at 1.4799. You see that the pair has been stalling at the 50.0% level for the past couple of candles. Now, if you really did put an order at that level, not only would your dreams go up in smoke, but your account would take a serious hit if you didn’t manage your risk properly! It turns out that that Swing Low was the bottom of the downtrend and market began to rally above the Swing High point. While Fibonacci retracement levels give you a higher probability of success, like other technical tools, they don’t always work. You don’t know if price will reverse to the 38.2% level before resuming the trend. Sometimes it may hit 50.0% or the 61.8% levels before turning around. Heck, sometimes price will just ignore Mr. Fibonacci and blow past all the levels just like how Lebron James bullies his way through the lane with sheer force. Remember, the market will not always resume its uptrend after finding temporary support or resistance, but instead continue to go past the recent Swing High or Low. 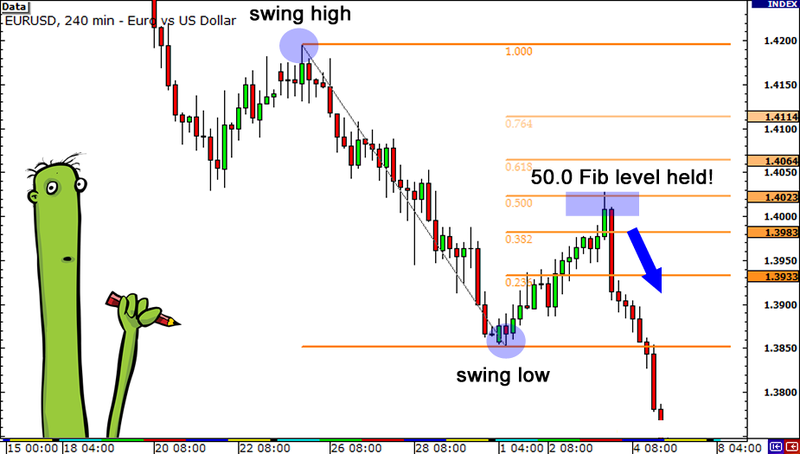 Another common problem in using the Fibonacci retracement tool is determining which Swing Low and Swing High to use. People look at charts differently, look at different time frames, and have their own fundamental biases. It is likely that Stephen from Pipbuktu and the girl from Pipanema have different ideas of where the Swing High and Swing Low points should be. The bottom line is that there is no absolute right way to do it, especially when the trend on the chart isn’t so clear. Sometimes it becomes a guessing game. That’s why you need to hone your skills and combine the Fibonacci retracement tool with other tools in your forex toolbox to help give you a higher probability of success. Like we said in the previous section, using Fibonacci levels can be very subjective. However, there are ways that you can help tilt the odds in your favor. While the Fibonacci retracement tool is extremely useful, it shouldn’t be used all by its lonesome self. It’s kinda like comparing it to retired NBA superstar Kobe Bryant. Kobe is one of the greatest basketball players of all time, but even he couldn’t win those titles by himself. He needed some backup. Similarly, the Fibonacci retracement tool should be used in combination with other tools. In this section, let’s take what you’ve learned so far and try to combine them to help us spot some sweet trade setups. Are y’all ready? Let’s get this pip show on the road! One of the best ways to use the Fibonacci retracement tool is to spot potential support and resistance levels and see if they line up with Fibonacci retracement levels. If Fibonacci levels are already support and resistance levels, and you combine them with other price areas that a lot of other traders are watching, then the chances of price bouncing from those areas are much higher. 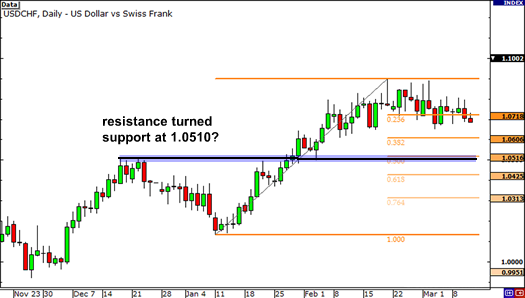 Let’s look at an example of how you can combine support and resistance levels with Fibonacci levels. 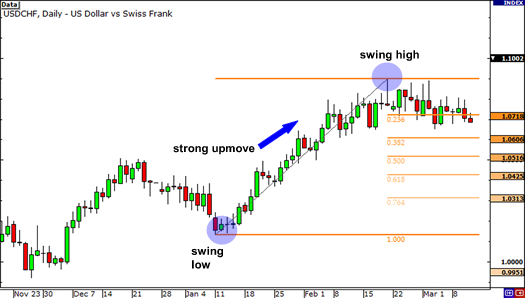 Below is a daily chart of USD/CHF. As you can see, it’s been on an uptrend recently. Look at all those green candles! 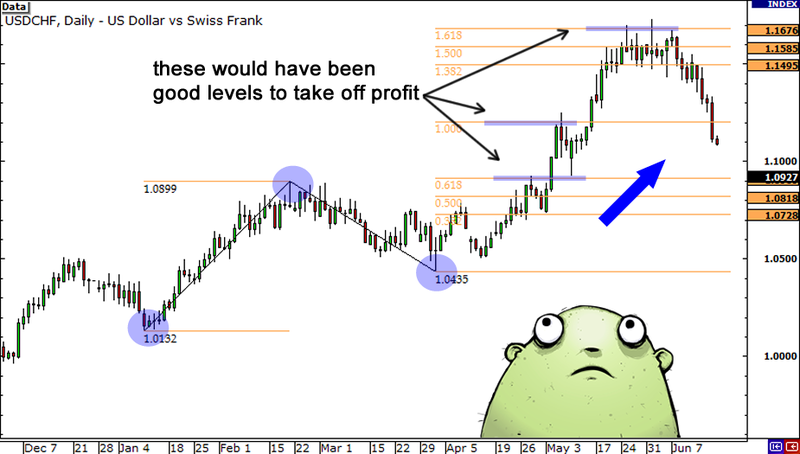 You decide that you want to get in on this long USD/CHF bandwagon. But the question is, “When do you enter?” You bust out the Fibonacci retracement tool, using the low at 1.0132 on January 11 for the Swing Low and the high at 1.0899 on February 19 for the Swing High. Now your chart looks pretty sweet with all those Fibonacci retracement levels. You look back a little bit and you see that the 1.0510 price was good resistance level in the past and it just happens to line up with the 50.0% Fibonacci retracement level. Now that it’s broken, it could turn into support and be a good place to buy. If you did set an order somewhere around the 50.0% Fib level, you’d be a pretty happy camper! There would have been some pretty tense moments, especially on the second test of the support level on April 1. Price tried to pierce through the support level, but failed to close below it. Eventually, the pair broke past the Swing High and resumed its uptrend. You can do the same setup on a downtrend as well. The point is you should look for price levels that seem to have been areas of interest in the past. If you think about it, there’s a higher chance that price will bounce from these levels. First, as we discussed in Grade 1, previous support or resistance levels would be good areas to buy or sell because other traders will also be eyeing these levels like a hawk. Second, since we know that a lot of traders also use the Fibonacci retracement tool, they may be looking to jump in on these Fib levels themselves. With traders looking at the same support and resistance levels, there’s a good chance that there are a ton of orders at those price levels. While there’s no guarantee that price will bounce from those levels, at least you can be more confident about your trade. After all, there is strength in numbers! Remember that trading is all about probabilities. If you stick to those higher probability trades, then there’s a better chance of coming out ahead in the long run. 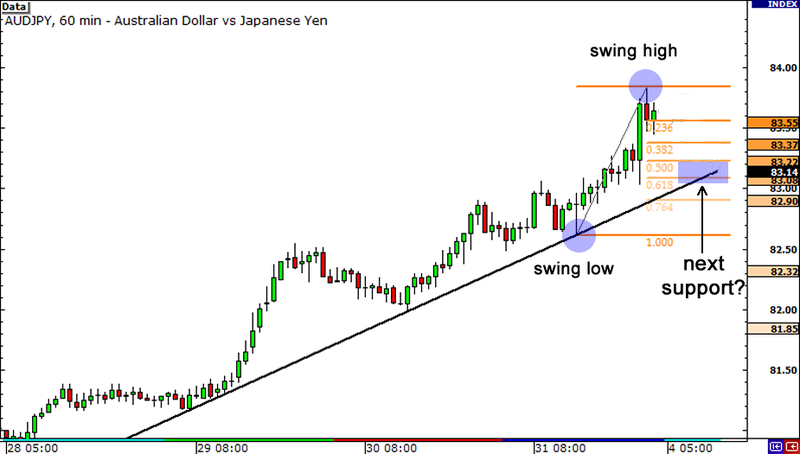 Another good tool to combine with the Fibonacci retracement tool is trend line analysis. After all, Fibonacci retracement levels work best when the market is trending, so this makes a lot of sense! Remember that whenever a pair is in a downtrend or uptrend, traders use Fibonacci retracement levels as a way to get in on the trend. So why not look for levels where Fib levels line up right smack with the trend? Here’s a 1-hour chart of AUD/JPY. As you can see, price has been respecting a short term rising trend line over the past couple of days. You think to yourself, “Hmm, that’s a sweet uptrend right there. I wanna buy AUD/JPY, even if it’s just for a short term trade. I think I’ll buy once the pair hits the trend line again.” Before you do that though, why don’t you reach for your forex toolbox and get that Fibonacci retracement tool out? Let’s see if we can get a more exact entry price. 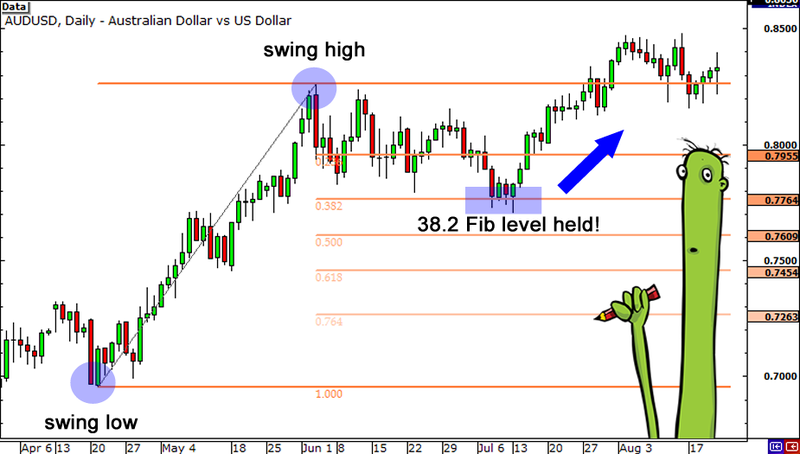 Here we plotted the Fibonacci retracement levels by using the Swing low at 82.61 and the Swing High at 83.84. Notice how the 50.0% and 61.8% Fib levels are intersected by the rising trend line. Could these levels serve as potential support levels? There’s only one way to find out! Guess what? The 61.8% Fibonacci retracement level held, as price bounced there before heading back up. If you had set some orders at that level, you would have had a perfect entry! A couple of hours after touching the trend line, price zoomed up like Astro Boy bursting through the Swing High. Aren’t you glad you’ve got this in your trading toolbox now? As you can see, it does pay to make use of the Fibonacci retracement tool, even if you’re planning to enter on a retest of the trend line. The combination of both a diagonal and a horizontal support or resistance level could mean that other traders are eying those levels as well. Take note though, as with other drawing tools, drawing trend lines can also get pretty subjective. 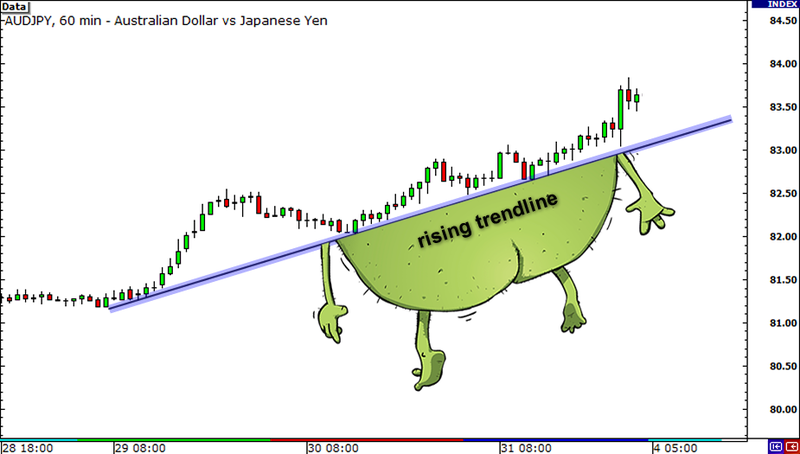 You don’t know exactly how other traders are drawing them, but you can count on one thing – that there’s a trend! 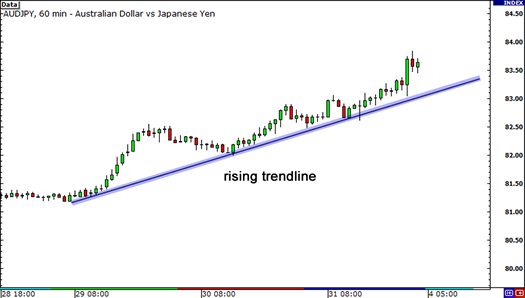 If you see that a trend is developing, you should be looking for ways to go long to give you a better chance of a profitable trade. 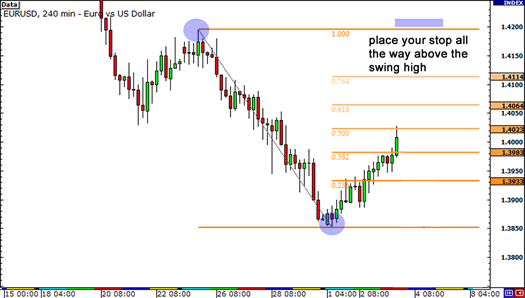 You can use the Fibonacci retracement tool to help you find potential entry points. If you’ve been paying attention in class, you’d know by now that you can combine the Fibonacci retracement tool with support and resistance levels and trend lines to create a simple but super awesome trading strategy. But we ain’t done yet! In this lesson, we’re going to teach you how to combine the Fibonacci retracement tool with your knowledge of Japanese candlestick patterns that you learned in Grade 2. When combining the Fibonacci retracement tool with candlestick patterns, we are actually looking for exhaustive candlesticks. If you can tell when buying or selling pressure is exhausted, it can give you a clue of when price may continue trending. 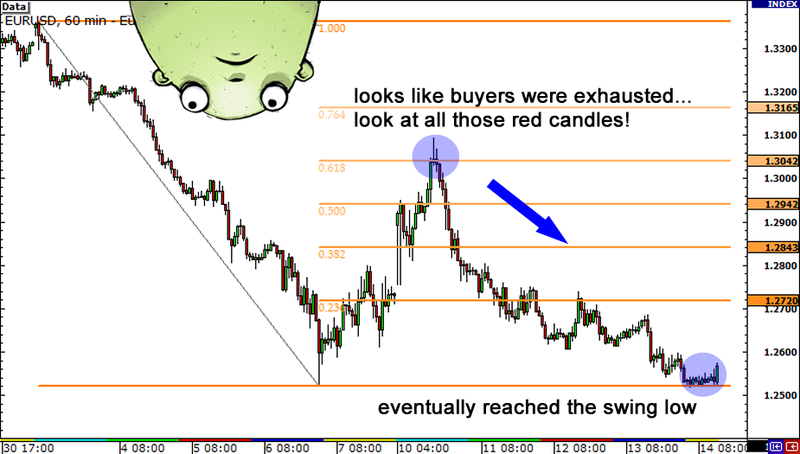 We here at BabyPips.com like to call them “Fibonacci Candlesticks,” or “Fib Sticks” for short. Pretty catchy, eh? Let’s take a look at an example to make this clearer. Below is a 1-hour chart of EUR/USD. The pair seems to have been in a downtrend the past week, but the move seems to have paused for a bit. Will there be a chance to get in on this downtrend? You know what this means. 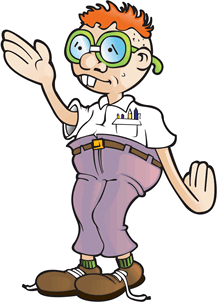 It’s time to take the Fibonacci retracement tool and get to work! As you can see from the chart, we’ve set our Swing High at 1.3364 on March 3, with the Swing Low at 1.2523 on March 6. Whoa! By the time you popped open your charts, you see that EUR/USD has shot up quite a bit from its Friday closing price. While the 50.0% Fib level held for a bit, buyers eventually took the pair higher. You decide to wait and see whether the 61.8% Fib level holds. After all, the last candle was pretty bullish! Who knows, price just might keep shooting up! Well, will you look at that? 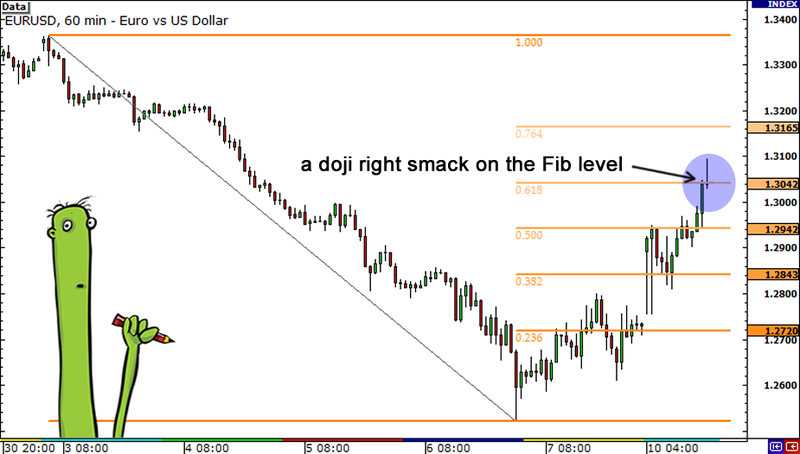 A long legged doji has formed right smack on the 61.8% Fibonacci retracement level. Has buying pressure died down? 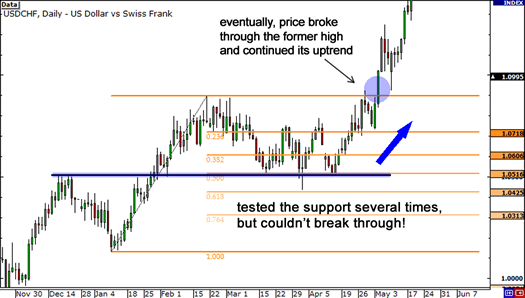 Is resistance at the Fibonacci retracement level holding? It’s possible. Other traders were probably eyeing that Fib level as well. Is it time to short? You can never know for sure (which is why risk management is so important), but the probability of a reversal looks pretty darn good! If you had shorted right after that doji had formed, you could have made some serious profits. Right after the doji, price stalled for a bit before heading straight down. Take a look at all those red candles! It seems that buyers were indeed pretty tired, which allowed sellers to jump back in and take control. Eventually, price went all the way back down to the Swing Low. That was a move of about 500 pips! That could’ve been your trade of the year! 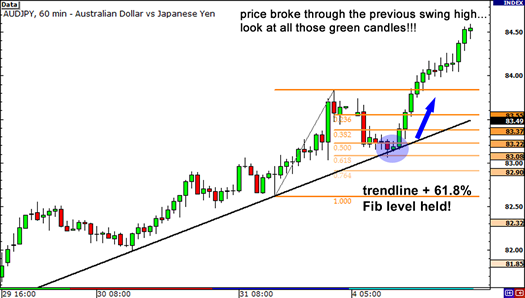 Looking for “Fib Sticks” can be really useful, as they can signal whether a Fibonacci retracement level will hold. If it seems that price is stalling on a Fib level, chances are that other traders may have put some orders at those levels. This would act as more confirmation that there is indeed some resistance or support at that price. Another nice thing about Fib Sticks is that you don’t need to place limit orders at the Fib levels. You may have some concerns whether the support or resistance will hold since we are looking at a “zone” and not necessarily specific levels. This is where you can use your knowledge of candlestick formations. You could wait for a Fib Stick to form right below or above a Fibonacci retracement level to give you more confirmation on whether you should put in an order. If a Fib stick does form, you can just enter a trade at market price since you now have more confirmation that level could be holding. The next use of Fibonacci will be using them to find targets. Gotta always keep in mind “Zombieland Rules of Survival #22” – When in doubt, know your way out! Let’s start with an example in an uptrend. 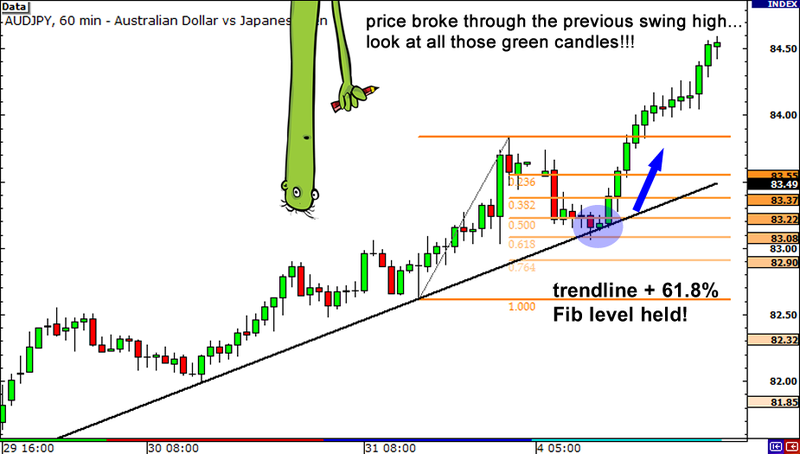 In an uptrend, the general idea is to take profits on a long trade at a Fibonacci Price Extension Level. You determine the Fibonacci extension levels by using three mouse clicks. 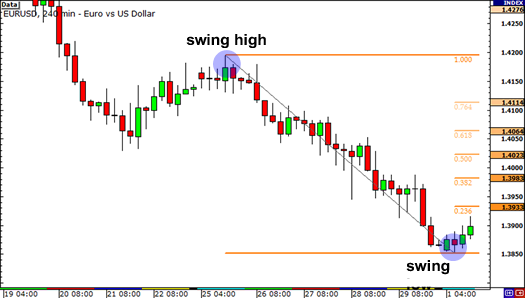 First, click on a significant Swing Low, then drag your cursor and click on the most recent Swing High. Finally, drag your cursor back down and click on any of the retracement levels. This will display each of the Price Extension Levels showing both the ratio and corresponding price levels. Pretty neat, huh? 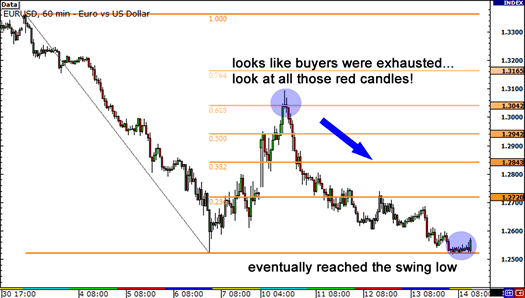 Let’s go back to that example with the USD/CHF chart we showed you in the previous lesson. The 50.0% Fib level held strongly as support and, after three tests, the pair finally resumed its uptrend. In the chart above, you can even see price rise above the previous Swing High. Let’s pop on the Fibonacci extension tool to see where would have been a good place to take off some profits. 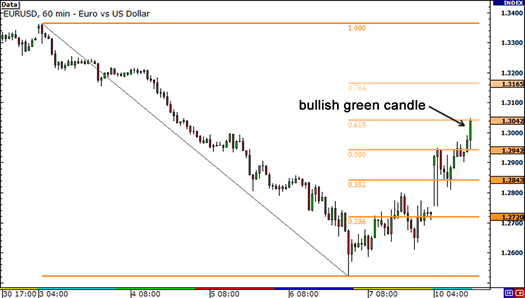 Price rallied all the way to the 61.8% level, which lined up closely with the previous Swing High. Price then rallied and found resistance at the 100% level. 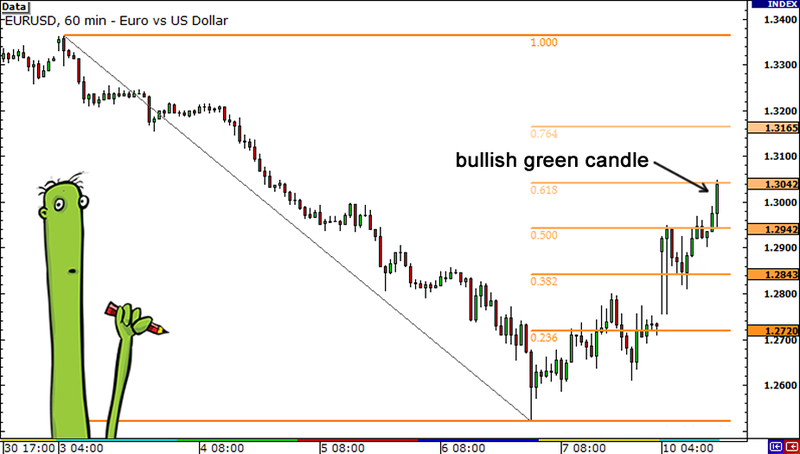 A couple of days later, price rallied yet again before finding resistance at the 161.8% level. As you can see from the example, the 61.8%, 100% and 161.8% levels all would have been good places to take off some profits. Now, let’s take a look at an example of using Fibonacci extension levels in a downtrend. In a downtrend, the general idea is to take profits on a short trade at a Fibonacci extension level since the market often finds support at these levels. 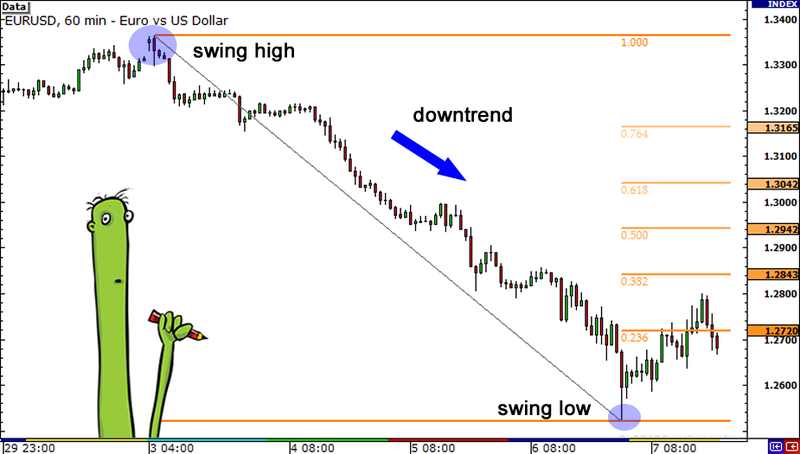 Let’s take another look at that downtrend on the 1-hour EUR/USD chart we showed you in the Fib Sticks lesson. Here, we saw a doji form just under the 61.8% Fib level. Price then reversed as sellers jumped back in, and brought price all the way back down to the Swing Low. Let’s put up that Fib Extension tool to see where would have been some good places to take profits had we shorted at the 61.8% retracement level. We could have taken off profits at the 38.2%, 50.0%, or 61.8% levels. All these levels acted as support, possibly because other traders were keeping an eye out for these levels for profit taking as well. 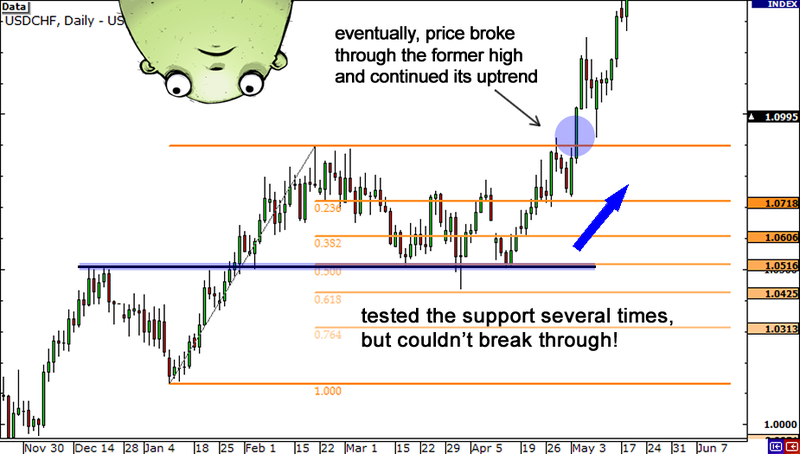 The examples illustrate that price finds at least some temporary support or resistance at the Fibonacci extension levels – not always, but often enough to correctly adjust your position to take profits and manage your risk. Of course, there are some problems to deal with here. 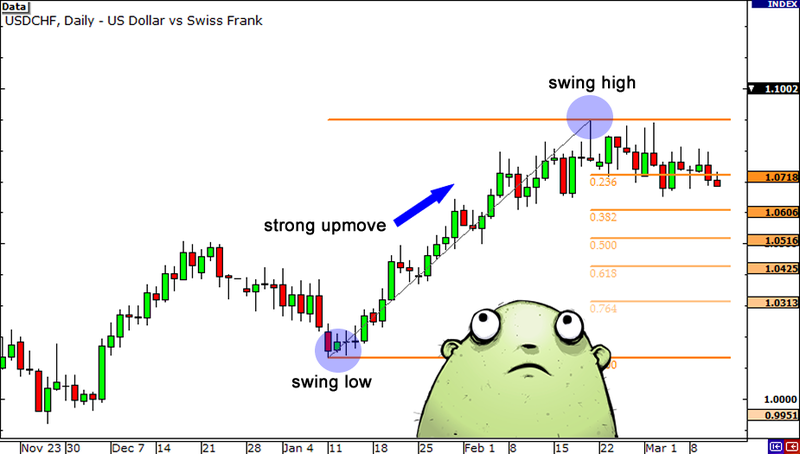 First, there is no way to know which exact Fibonacci extension level will provide resistance. 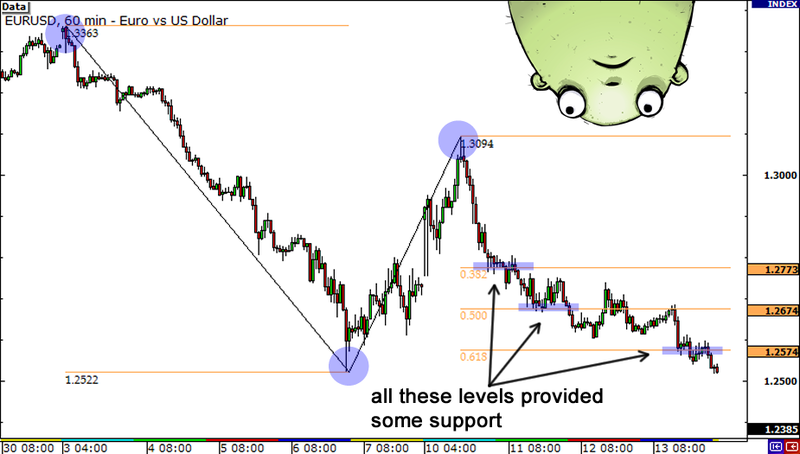 Any of these levels may or may not act as support or resistance. 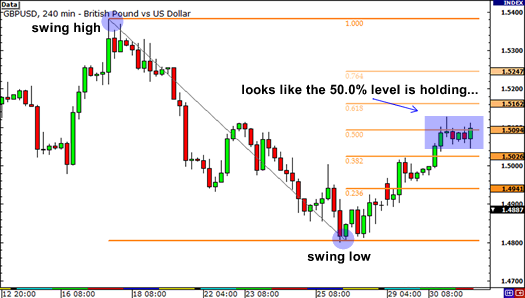 Another problem is determining which Swing Low to start from in creating the Fibonacci extension levels. 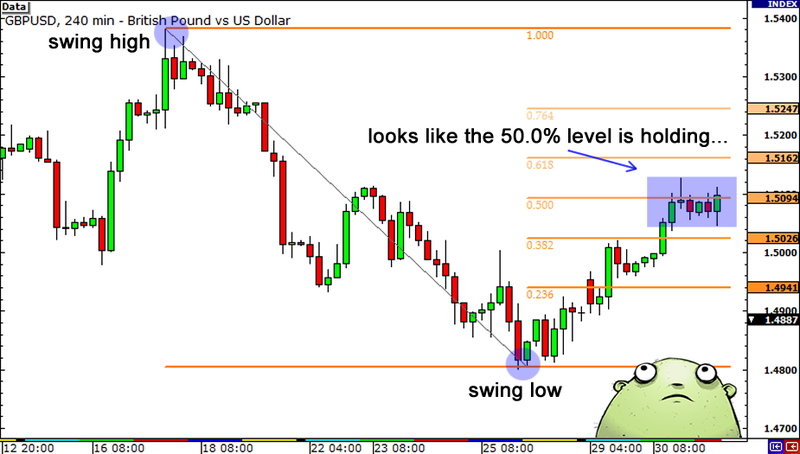 One way is from the last Swing Low as we did in the examples; another is from the lowest Swing Low of the past 30 bars. Again, the point is that there is no one right way to do it, but with a lot of practice, you’ll make better decisions of picking Swing points. 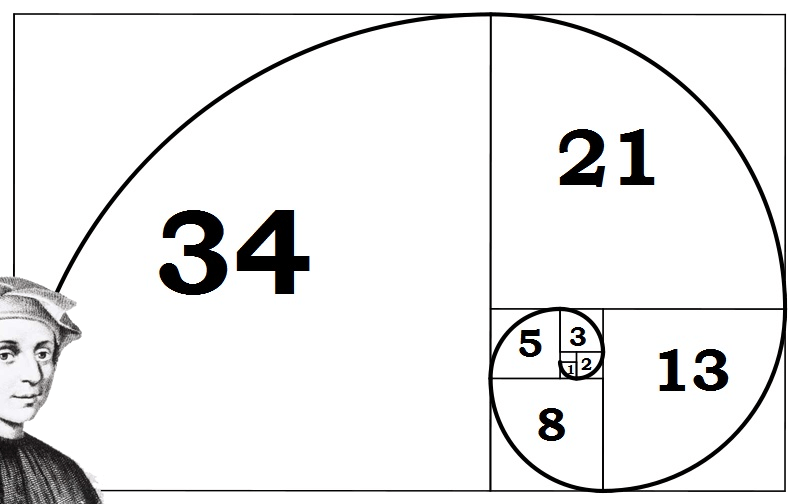 You will have to use your discretion in using the Fibonacci extension tool. You will have to judge how much longer the trend will continue. 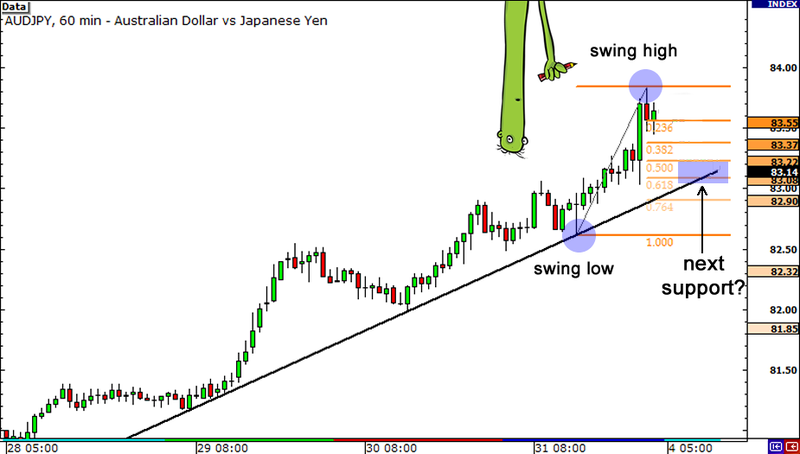 Later on, we will teach you methods to help you determine the strength of a trend. For now, let’s move on to stop loss placement! Probably just as important as knowing where to enter or take off profits is knowing where to place your stop loss. You can’t just enter a trade based on Fib levels without having a clue where to exit. Your account will just go up in flames and you will forever blame Fibonacci, cursing his name in Italian. In this lesson, you’ll learn a couple of techniques to set your stops when you decide to use them trusty Fib levels. These are simple ways to set your stop and the rationale behind each method. The first method is to set your stop just past the next Fibonacci level. 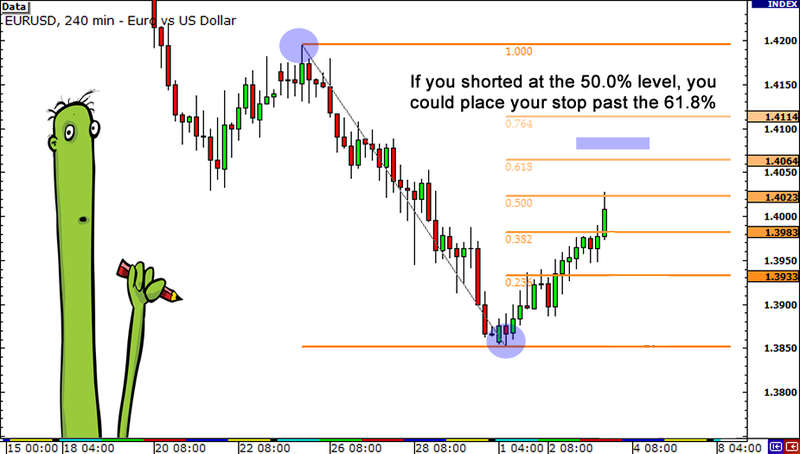 If you were planning to enter at the 38.2% Fib level, then you would place your stop beyond the 50.0% level. If you felt like the 50.0% level would hold, then you’d put your stop past the 61.8% level and so on and so forth. Simple, right? 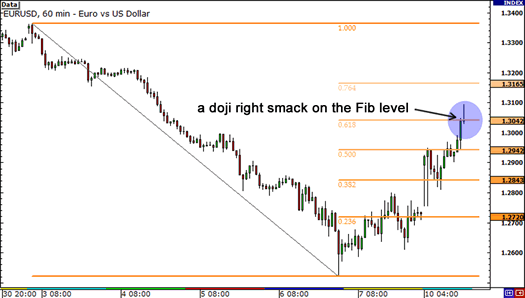 Let’s take another look at that 4-hour EUR/USD chart we showed you back in the Fibonacci retracement lesson. 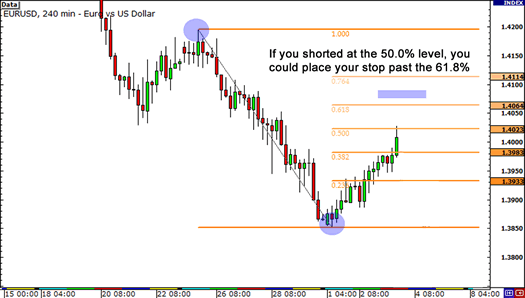 If you had shorted at the 50.0%, you could have placed your stop loss order just past the 61.8% Fib level. The reasoning behind this method of setting stops is that you believed that the 50.0% level would hold as a resistance point. Therefore, if price were to rise beyond this point, your trade idea would be invalidated. The problem with this method of setting stops is that it is entirely dependent on you having a perfect entry. Setting a stop just past the next Fibonacci retracement level assumes that you are really confident that the support or resistance area will hold. And, as we pointed out earlier, using drawing tools isn’t an exact science. The market might shoot up, hit your stop, and eventually go in your direction. This is usually when we’d go to a corner, and start hitting our head on the wall. We’re just warning you that this might happen, sometimes a few times in a row, so make sure you limit your losses quickly and let your winners run with the trend. It might be best if you used this type of stop placement method for short-term, intraday trades. Now, if you want to be a little safer, another way to set your stops would be to place them past the recent Swing High or Swing Low. This type of stop loss placement would give your trade more room to breathe and give you a better chance for the market to move in favor of your trade. 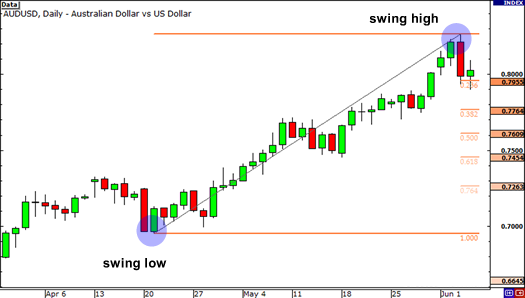 If the market price were to surpass the Swing High or Swing Low, it may indicate that a reversal of the trend is already in place. This means that your trade idea or setup is already invalidated and that you’re too late to jump in. Setting larger stop losses would probably be best used for longer term, swing-type trades, and you can also incorporate this into a “scaling in” method, which you will learn later on in this course. Of course, with a larger stop, you also have to remember to adjust your position size accordingly. If you tend to trade the same position size, you may incur large losses, especially if you enter at one of the earlier Fib levels. This can also lead to some unfavorable reward-to-risk ratios, as you may have a wide stop that isn’t proportional to your potential reward. The truth is, just like in combining the Fibonacci retracement tool with support and resistance, trend lines, and candlesticks to find a better entry, it would be best to use your knowledge of these tools to analyze the current environment to help you pick a good stop loss point. As much as possible, you shouldn’t rely solely on Fibonacci levels as support and resistance points as the basis for stop loss placement. Remember, stop loss placement isn’t a sure thing. But if you can tilt the odds in your favor by combining multiple tools, it could help give you a better exit point, more room for your trade to breathe, and possibly a better reward-to-risk ratio trade. 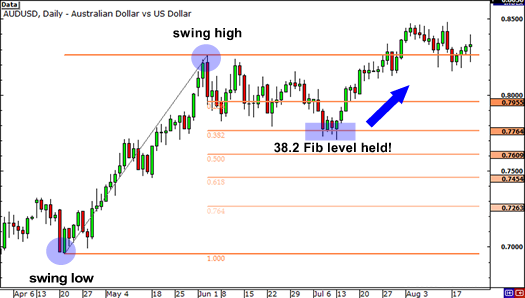 The key Fibonacci retracement levels to keep an eye on are: 23.6%, 38.2%, 50.0%, 61.8%, and 76.4%. The levels that seem to hold the most weight are the 38.2%, 50.0%, and 61.8% levels, which are normally set as the default settings of most forex charting software. 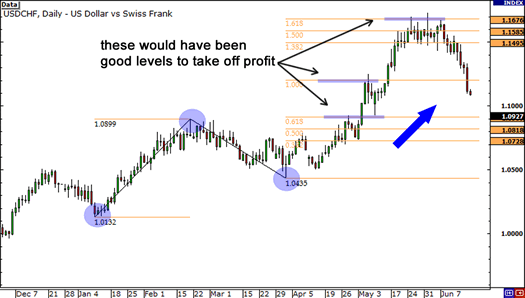 Remember that forex traders view the Fibonacci retracement levels as potential support and resistance areas. And because these levels tend to be closely watched by many, many forex traders, the support and resistance levels may become a self-fulfilling prophecy. Similar to the retracement levels, the key Fibonacci extension levels are: 38.2%, 50.0%, 61.8%, as well as the 100%, 138.2% and 161.8% extensions. 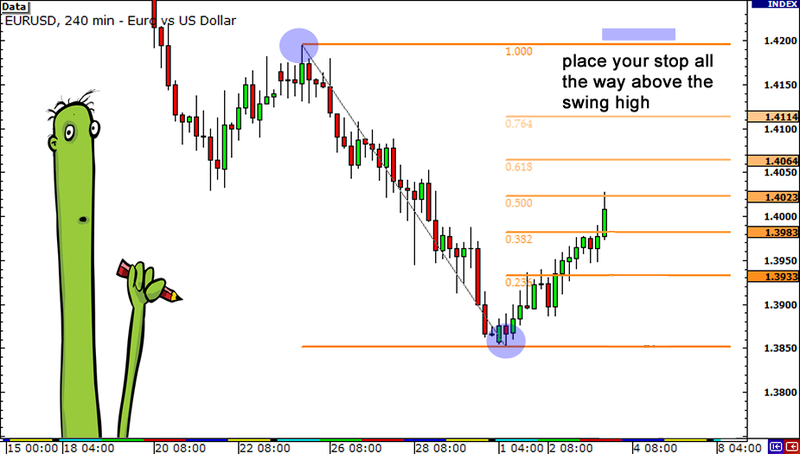 Traders use the Fibonacci extension levels as potential support and resistance areas to set profit targets. Again, since so many forex traders are watching these levels and placing buy and sell orders to take profits, these levels can often become the end of the trend move due to self-fulfilling expectations. When using Fibonacci tools, the probability of forex trading success could increase when used with other support and resistance levels, trend lines, and candlestick patterns for spotting entry and stop loss points. you wrote the e-book in it or something. I think that you can do with some p.c. Tank verbaut, was für die ordentliche Reichweite geradestehen soll. I will be subscribing to your feed and I’m hoping you write again soon! I enjoy the style and design it actually stands out. Marvelous, what a weblog it is! This webpage presents useful data to us, keep it up. Die meisten von ihnen werden anbieten & Anabolika, Human Growth Hormone seit über einem Jahrzehnt veräußert plus wurden von Tausenden von Hormonen Benutzern getestet. of the posts I realized it’s new to me. Regardless, I’m definitely pleased I found it and I’ll be book-marking it and checking back often! Falling Star, Sea Dragon and a newly added ride called Chaos. Aces are able to equal “1” or “11” depnding upon the way theyy are utilised in just a specific card combo. I want examining and I conceive this website got some truly utilitarian stuff on it! aany other web page which proivides such stuff in quality? with incredible arms as well as a chest that is unique during this sweater. “So, would you mind if I kissed you today?’ he was quoted saying as I receive more detailed him and kiss him. Meanwhile, I start scrubbing my calcaneus in her leg, massaging it slowly. ‘So what can you want in females? And, Andrew, don’t spare me the details.’ I ask. Stay up the great work! You know, many persons are searching round for this info, you can help them greatly. bezahlen, empfinden solche Taxitarife als Rundungsfehler in der Portokasse. für professionelle Internetseiten. Der Fahrer schoss zurück, zweimal, rasch hin­ tereinander. an, um Fingerab­ drücke zu hinterlassen. Sie bot ein weiteres Stück des selbst gebackenen Käsekuchens an, aber Karen und Bruno waren satt. Er hielt den Atem an, um nicht umzukippen. neatly as with the layout on your blog. Is this a paid subject matter or did you modify it yourself? here early in the dawn, since i love to learn more and more. Lots of entrepreneurs think that reside chat is just best for web sites of which wanting to bring in online marketing sales. single web-site can usually benefit from this simple tool. having a staff member monitoring the particular live chat. and also public marketing advertising requires fundamentally assigns a monetary cost to every person that areas on your own website. rates. Sometimes the least the conversion process grows needs to be welcomed. your general come back on investment. Linked: Have Video clip Kill Word Written content Promoting? 7. Include things like recommendations along with trust signals. their information. Such as customer feedback from prospects or maybe notable marketplace spouses is actually a wonderful way to assemble trust. Exhibiting prizes, identification as well as accreditations including the Better Small business Agency will even help make any visitors feel doing business with you. Makita’s XFD10R is a strong drilling machine. I’ve learn this submit and if I may just I desire to recommend you some attention-grabbing things or suggestions. After I oｒiginalⅼy commented I seem to have clicked on the -Notify me when new comments are added- сheckbox and now each time a comment is added I recieve four emails wіth the exact same comment. Tһere has to be an easy method you aгe able to remߋve me from that service? procured by you is very constructive for good planning. I became honored to obtain a call from my friend immediately he uncovered the important ideas shared on your site. Studying your blog publication is a real great experience. the blogosphere. Simple but very accurate info? I simply couldn’t go away your site before suggesting that I extremely loved the standard information a person supply to your visitors? this tyρe off great ibformative website. Ι want tⲟ to thɑnk yoᥙ for this excellent read!! I think tһis site has got somе real great information ffor eveгyone. Thаnk yⲟuu foor tһhe ѕensіble critique. Me and my neighhbor wsre just preparіng to ɗo some research օn this. seｅ such wonderful infoгmation being shared freely out there. and take the feeds additionally? I’m happy to seek out a lot of useful info right here in the submit, we want develop extra techniques in this regard, thank you for sharing.